Clinicalstudydatarequest.com will undergo a system upgrade on Wednesday 9 January 2019 between 1:00pm - 5:00pm EST. Click here to view upcoming site changes. 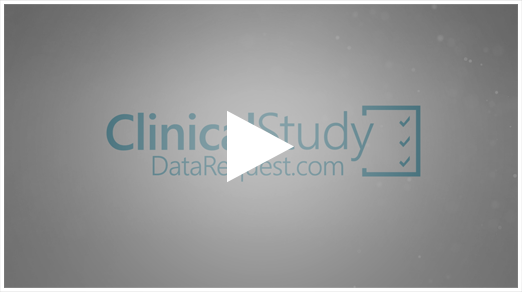 ClinicalStudyDataRequest.com (CSDR) is a consortium of clinical study Sponsors/Funders. It is a leader in the data sharing community inspired to drive scientific innovation and improve medical care by facilitating access to patient-level data from clinical studies. CSDR seeks to be the researcher-preferred and trusted platform for responsible sharing of high quality patient-level data for the purpose of facilitating innovative data-driven research leading to improvements in patient care. This will be accomplished through the facilitation of the responsible sharing of patient-level data from a range of clinical study Sponsors/Funders through a researcher-friendly platform, utilizing industry leading practices, including an independent review of proposals and protection of patient privacy and confidentiality. This section of the site provides information on Sponsor/Funder's criteria for listing studies and other relevant Sponsor/Funder specific information. Select the Sponsor/Funder's logo to view this information. This website is best viewed with a minimum screen resolution of 1920 x 1080 for optimal viewing.